Reading can be a great way to learn a language, but it’s not always easy to find texts which are both simple and interesting enough, especially for beginners. When you ask people for easy-to-read German texts, they will often recommend children stories, or books for young adults. That’s a great idea, but not everyone will want to read about pink giraffes and vampire drama all day long. 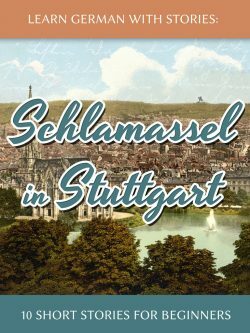 You could also try reading some German short stories or relatively simple novels, but for absolute beginners it can be daunting, so today I’d like to show you another source for easy-to-read German texts. It’s funny. German is a beautiful language for expressing scientific concepts, literary notions and philosophical ideas, but saying simple things can often become very complicated. If you’ve ever tried translating English to German you may have noticed that the German text is often double as long as the original. To say it with Mark Twain, the “mastery of the art and spirit of the Germanic language enables a man to travel all day in one sentence without changing cars“. He’s right. Sentences can ramble on and on, and when you finally reach the verb (which is conveniently positioned at the end) it can be tricky to remember what it even referred to. This is not just a problem for language learners, mind you. Many German native speakers are struggling with their own language as well, especially when it comes to certain grammar distinctions (Dative vs. Genitive, als vs. wie, etc.) or the horribly contrived Bürokratendeutsch of forms, contracts and other legal documents. For a while now there have been initiatives to simplify German, in order to make it more accessible for both non-native speakers and natives with cognitive or physical limitations. This new simplified German is called Leichte Sprache (literally: light or simple language) or Einfache Sprache (easy language). Only short sentences are being used. Each sentences contains only one statement. Only active-sentences are being used. Sentence structure is simplified to: Subject, Predicate, Object. Leichte Sprache is less regulated and more similar to the English concept of “plain language”, but the idea is the same: reducing language complexity in favor of accessibility. 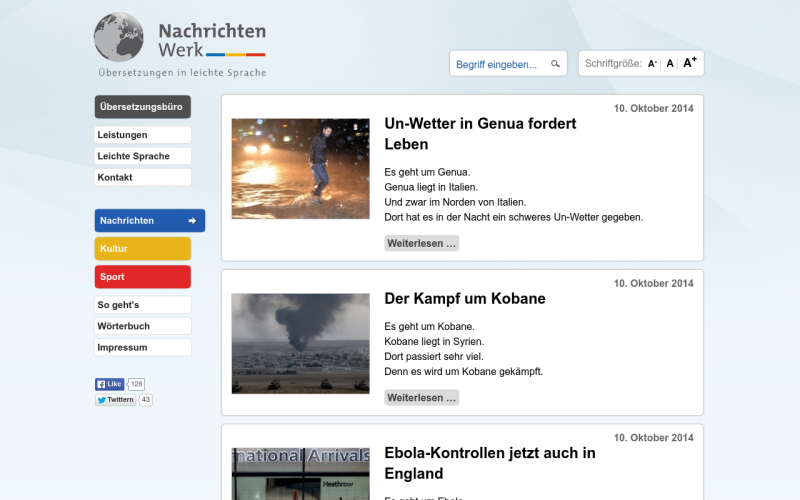 On the Nachrichtenwerk you can find very simple news articles and other texts in the three categories of “Kultur”, “Sport” and “Nachrichten”. The site is updated very frequently and has new relevant texts on a daily basis. The texts are even simplified visually, so that each short sentence occupies its own line. 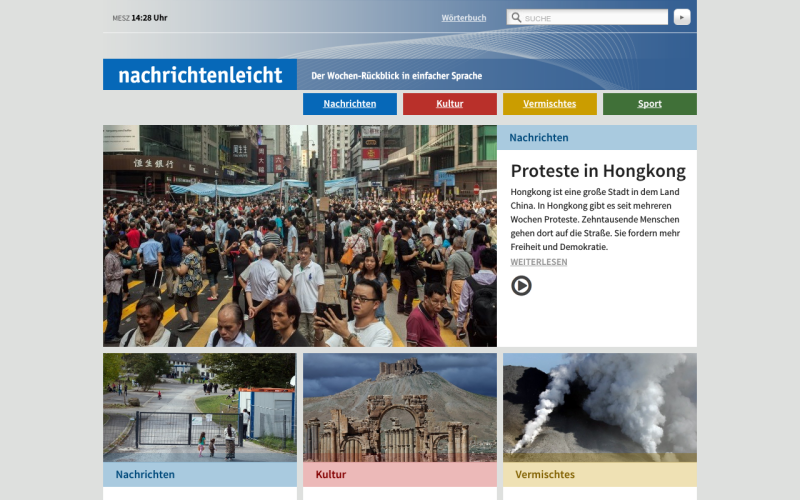 Another site that offers similarly simple texts about daily events and other topics is this service by the Deutschlandfunk. The layout is very clear and you can even get the short articles read out loud to you by clicking on the audio icon. 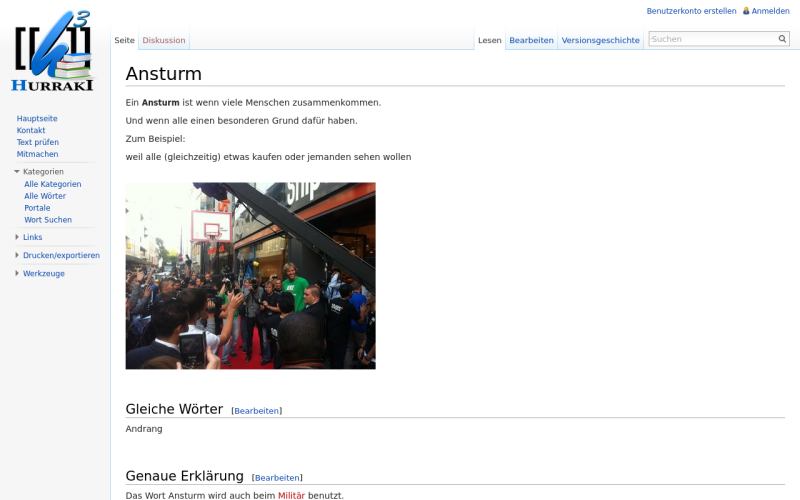 Also, under each article, important concepts mentioned in the text are explained in easy German. 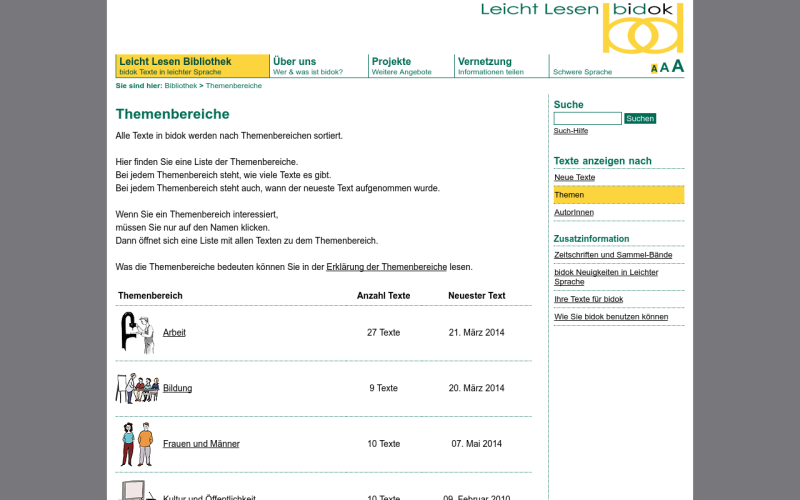 This site offers a library of simple German texts about a variety of different topics, such as work, education, life, politics, law and others. The texts themselves are presented in a simplified layout, as well, with single lines, generous line-spacing and illustrations. This project is called Offene Bibel (open bible) and is a collaborative effort aimed at producing a complete translation of the bible in various modern alternatives. The Leichte Sprache edition is a work in progress and many chapters are still missing, but if you ever wanted to read this classic text in German, this might be a good way to start. This little PDF booklet will explain everything you need to know about football in plain and simple terms, including the often-explained but rarely-understood Abseits (offside). You know that feeling when you look up a word and the definition is even more complicated than the word itself? Follow the link above to find a free dictionary written in simple German. Sure, you could always just translate words to English or your native language, but actually looking up the definitions in an easy-to-read way can be a great practice in and of itself. Another dictionary in simple German is provided by Lebenshilfe. It’s not as well-stocked as Hurraki, but may prove to be helpful for learners. 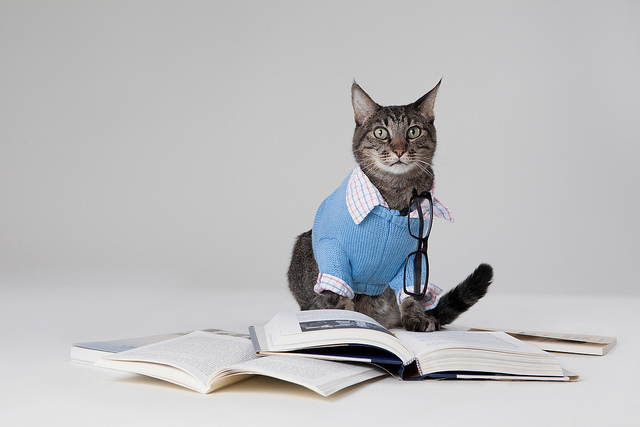 Study tip: Can you try to guess the words just by reading the definitions? Don’t be deterred by the first impression of this site. There’s a lot of content here. This site is a real treasure trove of legends, fairy-tales, ballads and other stories in short and concise German, originally published as a textbook series for hearing-impaired children in the GDR. Personally, I especially recommend the “Schwänke” (droll stories) category where you can find many of the traditional Eulenspiegel and Schildbürger prankster stories. All texts come as PDF with illustrations. If you’re looking for longer reading material, the Spaß Am Lesen Verlag publishing house has specialized in producing translations of popular classics into simple German, such as Wir Kinder vom Bahnof Zoo or Im Westen Nichts Neues. The books are only available as paperback editions, but you can read the first few chapters for free by clicking on the blue link at the bottom of the product pages. If you’re looking for even more simple stories for German learners, you can also take a look at our very own German learning library. There are murder mysteries, interactive fantasy stories, short comedy travelogues and more. All books are available as ebooks and paperback editions and come with a short German-English dictionary, illustrations and short comprehension exercises.